Raumfahrt+Astronomie-Blog von CENAP - Blog: Astronomie - Zeichen für Dunkle Materie Annihilation, erkannt? The Signature of Dark Matter Annihilation, Detected? We live in a dramatic epoch of astrophysics. Breakthrough discoveries like exoplanets, gravity waves from merging black holes, or cosmic acceleration seem to arrive every decade, or even more often. But perhaps no discovery was more unexpected, mysterious, and challenging to our grasp of the "known universe" than the recognition that the vast majority of matter in the universe cannot be directly seen. This matter is dubbed "dark matter," and its nature is unknown. According to the latest results from the Planck satellite, a mere 4.9% of the universe is made of ordinary matter (that is, matter composed of atoms or their constituents). The rest is dark matter, and it has been firmly detected via its gravitational influence on stars and other normal matter. Dark energy is a separate constituent. 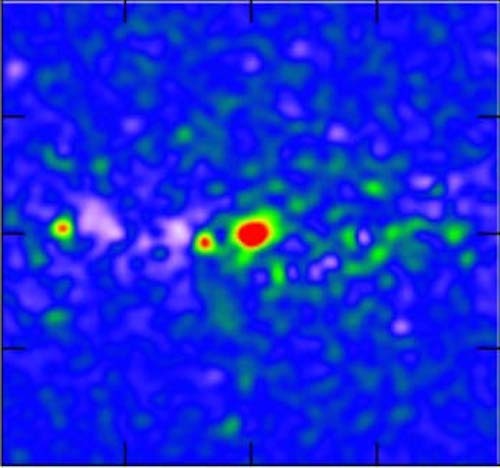 "The Characterization of the Gamma-Ray Signal from the Central Milky Way: A Compelling Case for Annihilating Dark Matter," Tansu Daylan, Douglas P. Finkbeiner, Dan Hooper, Tim Linden, Stephen K. N. Portillo, Nicholas L. Rodd, and Tracy R. Slatyer, in Physics of the Dark Universe, Elsevier, 2016.